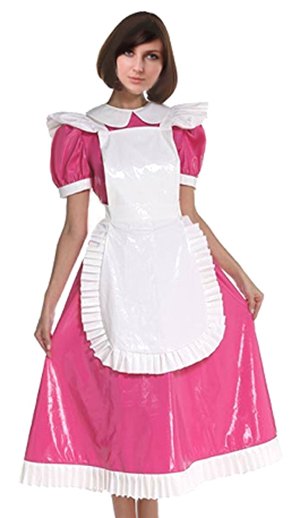 Amazing long sissy maid dress with elegant Peter Pan Collar on option with high neck), trimmed with wonderfully deep frills and with the matching frilly and full apron and cute head piece / cap. With this elegant design you will be the eye catcher on every party ! The dress has calf-length (on inquiry also available long down to the ankles). it is closed with a zipper at the back (on option with front zipper) and has elastical sleeves for comfort. The design is available in many glossy colours and fabrics. The apron, the Peter Pan Collar (or high neck), the sleeve trimmings and the frills are all colour matching. Additional options like lockable, long sleeves, high neck etc can be chosen.